Cooler nights call for warm dessert. 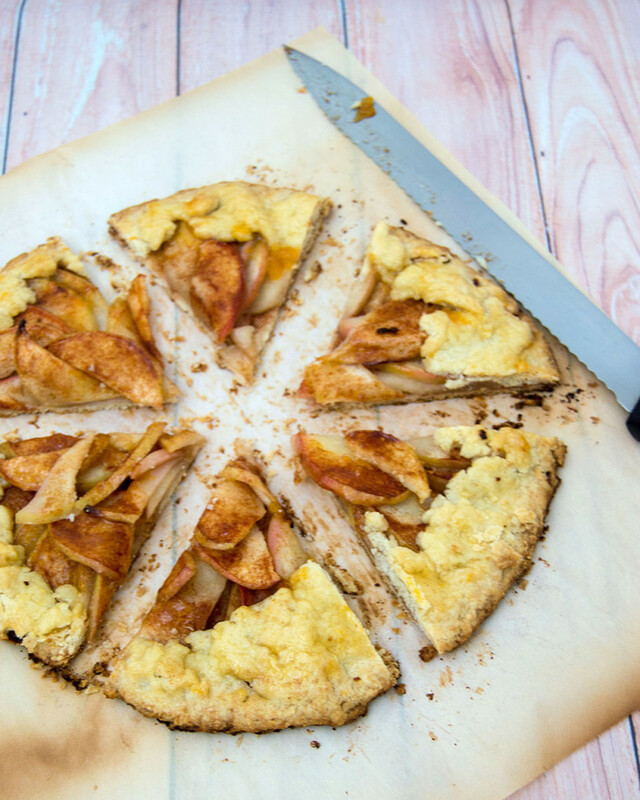 This honeycrisp apple tart combines sweet-tart apples, cinnamon and pie crust with no special baking dishes required! Summer is over. No more 80-degree weather. No more sunlight at 8 p.m. No more ice cream trucks driving through the neighborhood. It’s time to pack away the flip flops. I think our weather is a bit confused, though. Some of our supposed “fall” weather has been downright winter-like! We already had to break out the winter gear — heavy coats, hats and gloves. On some cold nights, after a meal of soul-warming comfort food, a warm dessert really hits the spot. Not only does the hot oven heat up the apartment, the toasty dessert just warms you to your core. 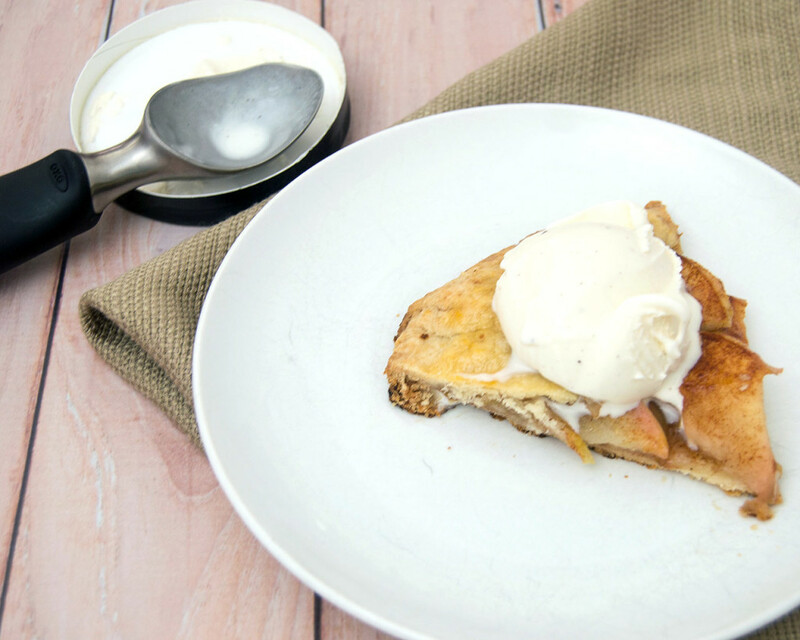 This honeycrisp apple tart is really easy to make. The pie crust comes together in the food processor, and baking the tart “rustic-style” on a baking sheet means no pie plate is required. No crimping pie edges — it’s supposed to look messy and rustic! I tried using the slicing feature on my food processor to make quick work of the apples, but it made the slices far too thin. They would have broken down into applesauce by the time the crust finished baking. If you can set the thickness on your food processor slicing blade, you can give it a try, or use a mandoline slicer — just make sure you use the hand guard to protect your fingers. Sure, the tart is topped with ice cream, which is rather cold, the warm tart melts the ice cream into a delicious complimentary sauce. I used vanilla ice cream, but cinnamon ice cream or even caramel would be delicious as well. This tart can be baked ahead of time and re-warmed in a 300-degree oven for about 15 minutes. Place the flour, salt and sugar in the bowl of a food processor. Pulse a few times to mix. While pulsing the machine, slowly stream 3 tbsp of the ice water into the food processor, until dough starts to form large clumps. If it doesn't, add more ice water, a tablespoon at a time, until large clumps form. Scrape clumps onto a floured surface and form into a ball. Flatten into a disk, wrap in plastic wrap, and refrigerate for at least 30 minutes, or overnight. 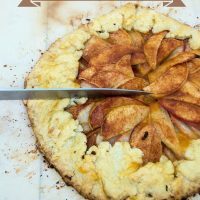 Place a sheet-pan-sized piece of parchment paper on a flat surface, and roll the pie dough on the parchment paper into a large circle, 1/4-inch thick. In a small bowl, stir together the sugar and cinnamon. Sprinkle half of the cinnamon sugar on the pie dough circle. Arrange the apple slices on the pie dough, leaving a 1-inch border around the edge. Fold the outer inch of pie dough over the apple filling in a free form manner. Sprinkle the remaining half of sugar over the top of pie dough and apples. 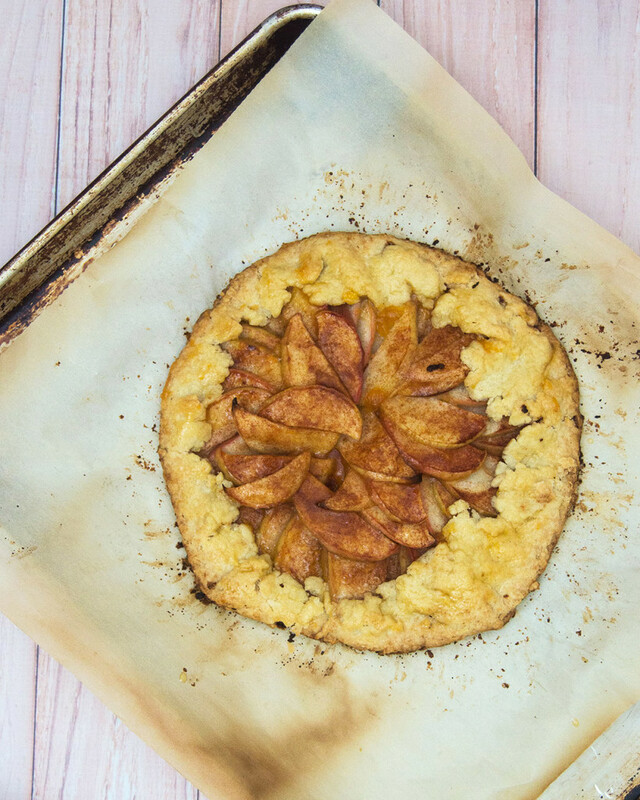 Slide the piece of parchment paper with the apple tart onto a baking sheet. Bake the tart for 45 minutes to an hour, until the crust is golden brown and the apples are soft. Slide the parchment paper with the tart onto a wire rack to cool slightly before slicing and serving. Garnish each slice with a scoop of ice cream. Discover more #SundaySupper warm-you-up recipes! I’m not a pie-baker, but I think I could handle this. Apple is my husband’s all-time favorite and this cinnamon-y goodness is just jumping off the page. I’ll be giving this a try. What a gorgeous rustic tart!! I love apple tarts! We just went apple picking and I’m putting together a list of things I want to make with all of these apples, this looks perfect! What a pretty tart, so delicious looking!! Such a beautiful classic dessert! I would love a slice … or two. 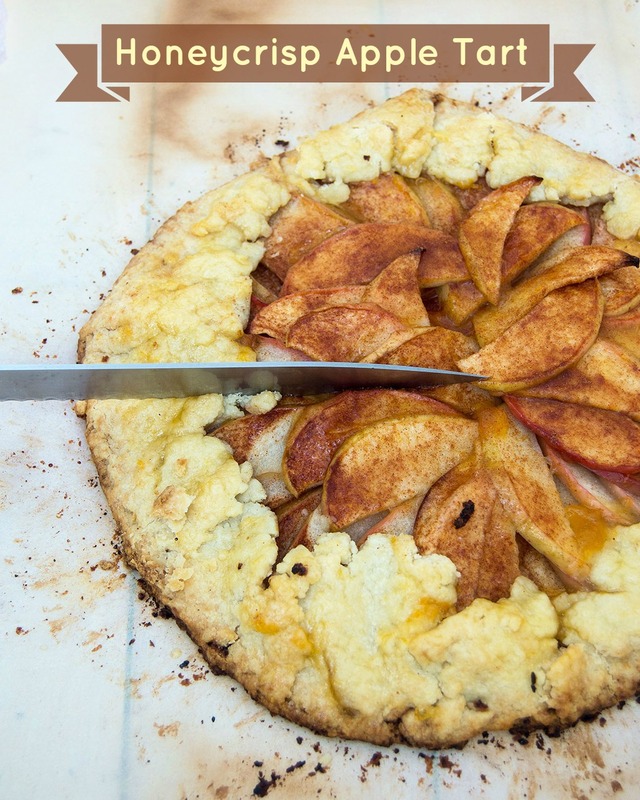 There’s nothing like an apple tart in the fall! Looks delicious! I love how rustic the tart looks. Honey Crisp apples are the absolute best! Such a tempting apple tart! Perfect with a scoop of ice cream!! I am ALL about the apple goodness this season – yum! Can butter be used instead of vegetable shortening for the crust? I don’t think I have ever seen or used solid vegetable shortening. Yes, you can omit the shortening and add another 2 tablespoons of cold, unsalted butter. Ooops I did not realize Crisco was a vegetable shortening.